HAPPY THANKSGIVING! Be safe to all who are going out for Black Friday Deals. Can You Still Hear? For the listeners of the podcast. I received several comments regarding the music volume. I want to apologize to all of my listeners, that is if you can still hear, to the volume of the music in my last podcast. I will "take it down a notch" in future podcasts. Thanks for being gentle with the comments. I had a good week. My "SewEzi" table was delivered on Wednesday. I purchased 2 plexiglass inserts. It was easy to assemble. This will be the home of my Brother Nouvelle 1500. Unless I need to use it for travel. Here is a pic with the machine in place. So now that the Brother has a home, it completes my quilting needs. One machine for piecing/embroidering, one for sewing binding/travel/as a backup and one for FMQ'ing. I have tried a new technique, new to me anyway, of spray basting a quilt. The technique is by Patsy Thompson and it is called "wall basting". If you own your home and plan to live there for awhile, here use of ceiling tiles is the way to go.If not, you can do what I did as a renter. I used push pins, in-expensive flannel backed table cloth, and can of 505 for basting. Here's a pic of my wall. "Pardon" the thread snippets on the carpet, right side of the packaging, Works are in Progress!!! I completed my DeJavu Neck Warmer, made from luscious Malabrigo worsted weight yarn. I can't believe it only took me a week to do! Now my daughter wants me to make her one. Her color choices are black's, grey's and white. I don't know why that child likes those dark colors! 90% of her wardrobe is black, grey, white and occasionally a pop of red. So, I purchased yarn to make her a Thermis Neck Warmer. I will admit, her yarn choice can be machine washed and dried! I don't need her to felt yarn that is a little more costly than big box store yarns. I also completed my "Twist" table topper/wall hanging-still have to add a label, if nothing other than quilt name, my name and a date. That brings me to what I am working on now. Three knitting projects, Nikki's neck warmer, the Weekend Shawl and the 10 stitch circular blanket. Yes, I said circular! After 3 tries at the rectangular version, I decided the circular one was easier. Last but not least, I have quilted my Mug Rugs for the swap. Now just need to ad a little binding. I hope to get them out before I head out of town this week. Pics to come soon. If you want to learn or just improve your free motion quilting, check out this blog. There's always room for more knowledge and fun. I am sure you will learn something. Perhaps a tip or a trick. Join me in the fun. Really, How Many is Too Many? Like many others, I am sure, I tend to accumulate a lot of projects of all types. These are just a few. I know if I dug deeper, I would find more! 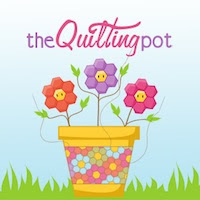 Below is a list of what I talked about in my podcast, "The Quilting Pot", episode #6. I hope the links work! Just copy and paste the URL. *Stretch Star-piecing in progress. I am using "chunking" technique for the piecing the ten 4 1/2" x twelve 4 1/2" squares. I started out connecting in twosies, then foursies, and so on. I have completed the first four rows. I am using luscious Malabrigo Worsted for this project. I am calling it DeJavu in honor of it's color. *Baltimore Christmas WH-starting Dec. 1st (12 mos. of Baltimore) I will hopfully update on my progress the last weekend of the month. My plan is to complete, as it is called, "a block a month". I recently purchased a "SewEzi" table to set up my Brother PQ1500 so that I can practice my FMQ. I won't have to change settings to practice. It will be always at the ready for Journal Tales. BTW, if you have every thought about podcasting give "School of Podcasting" by David Jackson a listen. He has some great tips. Ooops, I Forgot to Mention! I have diagnosed myself as having crafty induced "ADD". I don't seem to be able to stay focused on one or two projects. I have several projects, (fiber, fabric, yarn, markers), going on all at one time. How do you focus. I start with a couple of projects, before I know it I see or here something that I totally want to do. So what do I do? I start something new to add to the pot!! Does that sound like ADD to you? With the lack of the ability to focus on one thing before being distracted---it's sorta like----"Oh Look, There's A Squirrel", hence the title. Regardless of my self diagnosis, I a focused on improving my precision piecing. I had 3 suggestions that I have acted on, the book and DVD by Sally Collins, "Mastering Precision Piecing" (suggested by Pam & Nonnie respectively) and the single hole plate (suggested by Tammy in Denmark). I have thumbed through the book and viewed a portion of the DVD. I will admit, it is a lot of information to wrap your head around. Good stuff though! I will be testing out the new machine plate today while finishing the Irish Chain quilt top. The top is more than 3 yrs old. I used the Accuquilt Go "Doggy Die" to add an applique addition to the top. Inner and outer border still to come. Completed Mondo Bag. I still have to top stitch around the top and give it a press. In the midst of working on the Mondo Bag I decided I wanted to start a new project. I cut out a hefty backgound square and fused some hexagons and circles. I guess the talk about "attack of the Hexies", I wanted to be a part of it. Well this is my take!!! BTW, a whole lot quicker I may add. I call it: "Hex's and O's". I used my Accuquilt Go to cut the shapes. My question, does it need an inner and outer border? I purchased a fabric to use as an inner border and would use that background for the outer border and add the remaining hexagons and circles. What do you think? My idea of an art quilt in the making...proud to say it came from my brain. Pretty ok for a first!! What I scored on my "road trip"! * string quilt table runner and placemats for the holidays using the "Sushi Jelly Roll" pictured above. It doesn't scream Christmas but more like, it's the holidays. Thanks to all who commented in various places. BTW, TQP #5 is up! It's snow in October and TQP #4 is up! Yes, it has been snowing in my area, well sorta. The falling snow is what I call "wet snow". It's a little too warm for the snow to stick, however, you can definitely see the snow flakes. I got a little knitting in this week. I am still working on the scarf for my daughter. I must admit, this is the hardest fiber I have yet to work with. I thought mohair was difficult, but this stuff is just "awkward". I do love the look. Here is a pic of my progress. Episode #4 is a short podcast. I didn't do much quilting this week. Work has been getting in the way. I have been getting into bed around 7:30pm. Early you say? Yes, it is a little early, but I have been very tired. I babble a bit about my IPhone. I have lost service multiple times. The phone displays "sim failure". Let me just say, after being on the phone an hour and a half, I did not get anything resolved using Sprint. The bottom line, I had to take my phone to a "Apple Store". I hope the problem has been corrected, if not, I will be making another 28 mile trip back to the Apple Store to get a new phone. Quiltsmart Mondo Bag beginning. The is the pattern and jelly roll that I will be using to make my bag. If you look close, you can see the printed fusible interfacing. The wall hanging destined for binding. The picture is not very "sharp". I never said I was a photographer, however, you get an idea of what it looks like.